Last weekend I attended The Becoming Conference in Asheville, NC. The conference is about becoming creative, purposeful, and frugal. It is a day and a half of large sessions and small sessions about the three different areas with great speakers from great blogs. I have attended all 3 years that it has been running and this year I felt that I was pretty confident with the frugal part of it all. I decided to take part in the more purposeful side of things. I was very inspired by the speakers to start my own blog and share my stories and projects with everyone. One of my favorite things to do each week is nail art. I used to paint my nails, in all my adolescent glamour, when I was in middle school and high school. I quickly quit when I got more friends and activities. 🙂 I always liked designing my nails but never really did more than one color per nail. About six months ago I was on pinterest (my addiction) and saw that one of my friends had pinned nail art on their board. From then on I have been designing my nails every week without fail. This week was no exception. So it begins, my weekly nail post…. I coach middle school volleyball for the school I work at. Last year I adopted 3 siblings that went to my school, two of them were on my volleyball team. The older two are twins, a boy and a girl, they start high school next week. This week my adopted daughter has her first volleyball game with her high school team. Its a really big deal, at least it is to me. 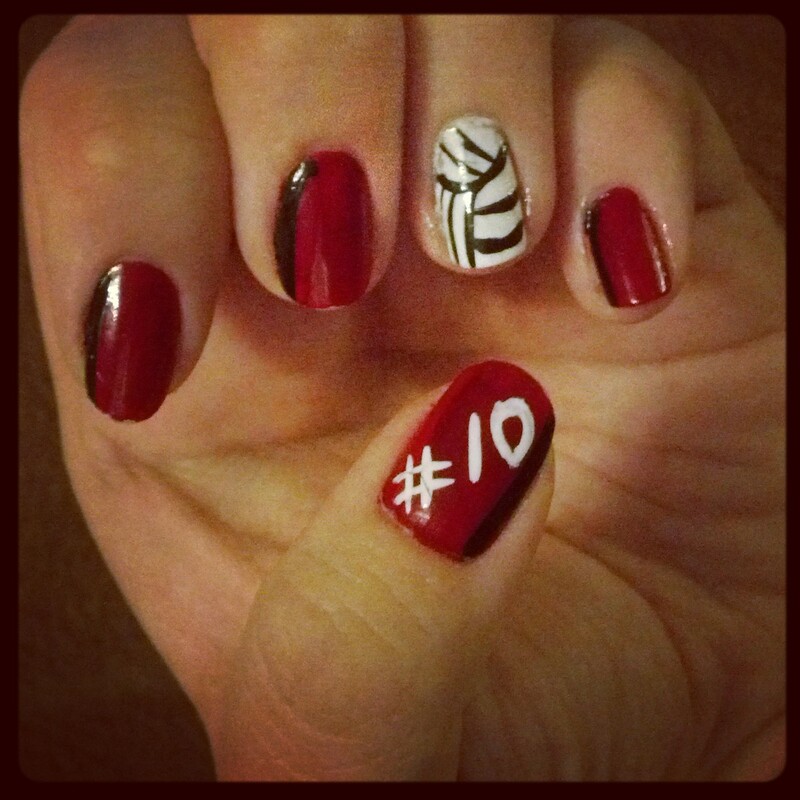 So I designed my nails in honor of her first game. Her school colors are red and black and her number is 10. I am so proud of her and all her accomplishments! Let me know what you guys think about the nails and if you have any ideas for future nail designs.